'View of the Cantonments at Berhampore'. Aquatint, drawn and engraved by James Moffat, published Calcutta 1806.
bl.uk > Online Gallery Home	> Online exhibitions	> Asia, Pacific and Africa Collections	> 'View of the Cantonments at Berhampore'. Aquatint, drawn and engraved by James Moffat, published Calcutta 1806. 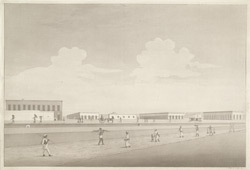 Aquatint of the cantonments at Berhampore drawn and engraved by James Moffat (1775-1815) and published in Calcutta in 1806. Berhampore is situated several miles from Murshidabad in West Bengal. In 1757, the Battle of Plassey between the Nawab of Bengal and the English East india Company resulted in the rise of English supremacy in Bengal. The military barracks of Berhampore, first established in around 1767, are one of the earliest English cantonments in India. The plan of the cantonment was made up of a grid with a large open square in the centre, which is shown in this view. By the early 19th century, Berhampore had developed into a large brigade station. The troops were withdrawn by Lord Kitchener in 1906.